So you’re travelling to Bangkok, and you’ve heard a lot about the spectacular rooftop bar scene. They are trendy, exciting, and plentiful. While they all provide stunning views of the city, what makes one more unique than another?, is there dress code?, will dinner and drinks break the bank?. From chic to nostalgic to affordable, let our guide of the top fifteen rooftop bars in Bangkok help you narrow down that to-do list. 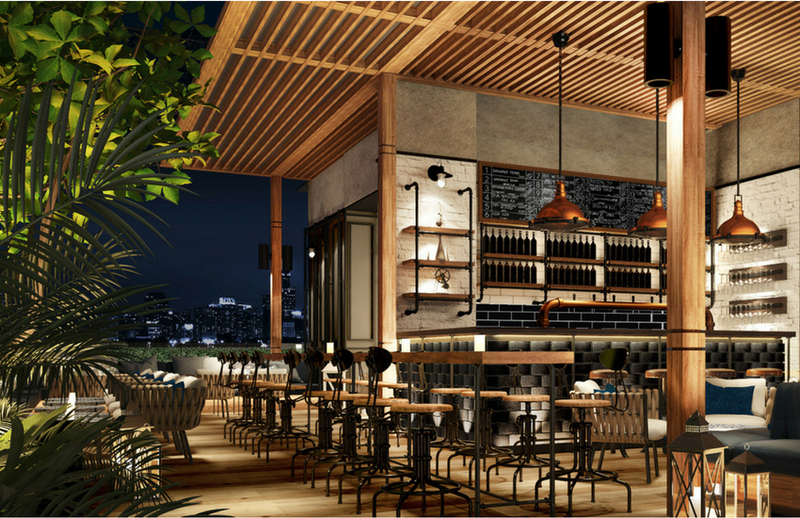 Two new additions bring this list to seventeen rooftop bars ... enjoy! This rooftop bar features a sprawling 180 degree view of the Bangkok skyline and is situated on the thirty third floor of the Fraser suites. With a modern, sleek decor and semi-casual dress code, Above Eleven makes an ideal location for a business dinner or a chic night out with friends. Visitors appreciated the signature cocktail list and Japanese/Peruvian cuisine. If you’d like to investigate this classic Bangkok rooftop bar and lounge, you can find it at 38/8 Soi Sukhumvit 11, Khlong Tan Nuea, Khet Vadhana. Open daily from 6:00p to 2:00a, it is definitely worth a visit. Known for its reasonable pricing, Cielo Skybar offers something for everyone. Tourists and locals alike enjoy this spot and its miles of views across the city. In addition to sofas, chairs, and tables, this bar makes sure to include large amounts of open space--contributing to a relaxed, more balanced atmosphere. A key feature of Cielo Skybar is its skywalk. Encased in glass, this walkway allows you to see straight through to the bottom floor of the building. An impressive site to be sure, it is not recommended for those with a fear of heights. If you’re feeling daring, though, you can find Cielo Skybar, open from 6:00p to 1:30a, at 69-69/1 Sukhumvit Road. Located on the seventeenth floor of the Central World at 999/9 Ratchadamri Road, this rooftop bar pairs modernism with industrialism. Stylish and current, Zense serves Thai, Japanese, Indian, Italian, and modern European cuisine. In addition to a varied dinner menu, their seasonal cocktails will have you relaxing in no time as you watch the bustle of the horse racing track and city traffic below. Zense offers ample seating, quick service, and stylishly modern decor. Whether you are dining in the spacious lower level or drinking on the upper balcony area, Zense offers something for everyone. L’Appart is a must-see location for anyone visiting or living in Bangkok. Designed in the image of a nineteenth century Peruvian apartment, it offers a warm, opulent style. In addition to its phenomenal views and geometrical layout of several interconnected rooms, wine pairings are one of the most highly praised aspects of this business. Choose from over thirty champagne labels and enjoy the generous happy hour from 5-7p. L’Appart is located at 189 Sukhumvit Rd Soi 13-15 Klongtoey Nuea Wattana on the 32nd floor of the Sofitel Sukhumvit Hotel. With panoramic views of Bangkok and Chatuchak Park, Bluesky offers a peaceful dining experience. This bar’s contemporary decor, terraced patio seating, and ethereal blue lighting make it a sought after dining location. While more expensive than its competitors, the western influenced cuisine receives positive reviews. Open from 6p-2a, you can find this restaurant and bar at 1695 Phaholyothin Road Centara Grand at the Central Plaza Ladprao. With a smart casual dress code, Vertigo and Moon Bar stands as the second highest rated rooftop bar in Bangkok. If you’re looking for a stylish spot with 360 degree views of the city, this is your place. While many of their competitors divide the restaurant and bar by tiers, Vertigo and Moon Bar uses the entire 61st floor so that diners and cocktailers alike can enjoy the vivid views of Bangkok. You will spend a bit more money here, but with excellent customer-reviewed service and imported seafood and steaks you will find it worth your while. Located at 21/100 South Sathon Road, Vertigo and Moon Bar occupies the 61st floor of the The Banyan Tree Hotel. On the 45th floor of the Marriot Hotel at 2 Sukhumvit Soi 57, Octave stands apart from its fellow rooftop bars. With three separate levels, it features a lounge area, the bar, and the high energy, club-like third level. Whether you’re looking to enjoy a chic drink with friends, an after-work beer, or dance the night away, Octave has a spot for you. 360 degree views range from the Chao Phraya River to the bustling city streets. Food is mostly limited to tapas and small bites to keep you satiated as you enjoy their signature cocktails. This is also the closest roof bar to our five star Bangkok hotel. Located at 123 Charoennakorn Road in the luxury hotel district, Three Sixty is happily at home in the Millenium Hilton Hotel. This venue provides a more intimate, mellow vibe in which to unwind throughout the evening. Enjoy views of the Chao Phraya River through the convenient floor to ceiling glass, angled walls of the upstairs cupola. Generous portions and a sophisticated yet comfortable atmosphere make Three Sixty a great choice to enjoy an evening in Bangkok. This casual bar boasts views of downtown Bangkok and the National Stadium. With no specified dress code, feel free to stop in after a day of shopping or after many hours at the office. The Roof Gastro offers French, Western, and Thai cuisine. Taking it one step further, they also equip tables with volcanic stone grills that allow you to cook directly at your table. Combined with spectacular views and an affordable price Point, this pub lets you enjoy the best of Bangkok without breaking the bank. The Roof Gastro is located on the 25th floor of the [email protected] Hotel. Another gem of rooftop bars is The Speak Easy located on the 24th and 25th floors of the Muse Deluxe Hotel at 55/555 Langsuan Road. Step back to an earlier time in this 1920s inspired lounge. Jazz music will serenade you as you sip on one of the many vintage cocktails offered. The French martini and Sazerac are among the most popular. Enjoy the Long bar on the 24th floor or the cozy tables and floor lamps on upstairs terrace. For the cigar lover, the Blind Pig Liquor Lounge is your place. Borrow a smoking jacket and enjoy a cocktail, but don’t forget to make a reservation. In the Le Fenia Hotel on Sukhumvit Soi 11, the Nest Rooftop Bar places a significant emphasis on relaxation. Oversized daybeds rest lazily in sand, providing you vacation-worthy luxury. The views may not be as spectacular as other venues, but what this bar lacks in visual splendor it more than makes up for in service and accessibility. A happy hour from 6-10p lures you in while the asian euro fusion cuisine keeps you there for dinner. For the wine lovers in Bangkok, this pub is a necessary stop. Located in the Pullman Bangkok King Power 8-2 Rangnam Road Thanon-Phayathai, Wine Pub features forty-eight wines by the glass and a hundred by the bottle. Rest assured, they have a wine to suit your mood and palate on any given day. For those of you who are less confident about wine, an in house sommelier is available to steer you in the right direction. Exceptional french bistro style food is also available to compliment your wine selection. If city-gazing and live music are your priorities, Cloud 47 fits the bill. With 180 degree panoramic views of downtown, Chao Phraya River, and Lumpini Park, this bar is both beautiful and affordable. The thai cuisine pairs well with the cocktail and wine menus. If you’re looking to experience a quintessential, chic rooftop bar in Bangkok, this place will get you there without breaking the bank. Lauded for its affordability, Cloud 47 can be found on the 47th floor of the United Center Office Tower at 323 Silom Road. Zoom Skybar is located on the 40th floor of the Anantara Sathorn Hotel at 36 Narathiwat Ratchanakarin Road. 360 degree views ornament your evening whether you’re grooving on the dance floor, relaxing in the lounge area, or drinking at the rectangular bar. The cocktail menu is divided into three large sections: originals, classics, and champagne-based. Order the chicken satay or foie gras crostini from their menu of french food with an asian twist to accompany your drinks. This bar has a little of everything, making it a great stop if you’re with a group. This romantic rooftop bar can be found on the 29th floor of Sofitel So Bangkok at 2 North Sathorn Road. Gaze out at Lumpini Park and the skylines of Siam and Silom. The french style haute gastronomic is available a la carte and for whole table sharing. Park Society is an ideal choice for a date. Share a few tapas and cocktails while relaxing in your private rooftop cabanas. Available by reservation only, these seats add to the already charming atmosphere. At a reasonable price point, this bar should make your list of places to visit in Bangkok. We have added two new rooftop bars to visit, so we now have 17 amazing rooftop bars for you to relax and enjoy Bangkok's amazing city scapes from. 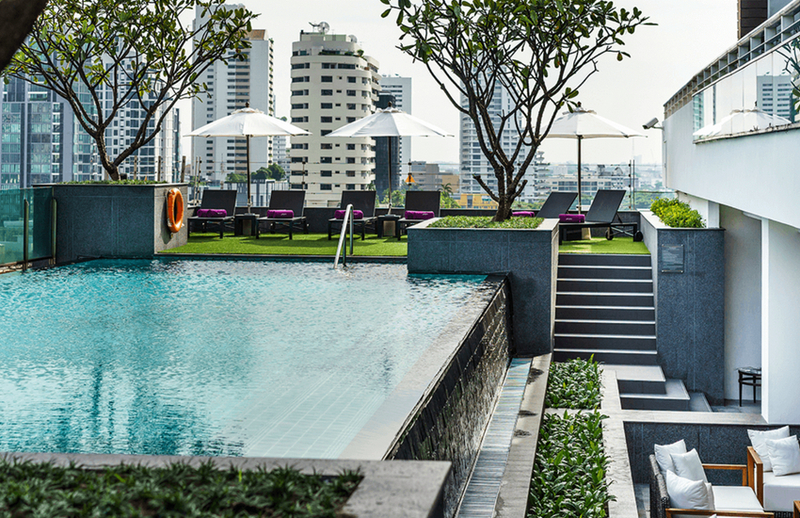 Otto Pool Bar offers resort-style living in the heart of the city with comfortable outdoor seating by an expansive double infinity-edged pool that boasts 180-degree views across Bangkok’s leafy residential enclaves. The bar serves a selection of refreshing beverages, including Asahi Extra Cold draft beer, cooled to minus 2.2 degrees and perfect for a balmy Bangkok evening. In a city of rooftop bars, Rise Rooftop Bar still manages to lift its head above the rest with an edgy, yet elegant design. Open from 16:00 – 1:00 hrs, the stylish urban space is open for in-house guests and outside visitors. Now it’s time to get out there and do some research in the field. Bring your camera, your appetite, and your friends. If you're still feeling overwhelmed by all the exquisite choices, our concierge at akyra Thonglor Hotel and akyra TAS Sukhumvit can offer further recommendations. 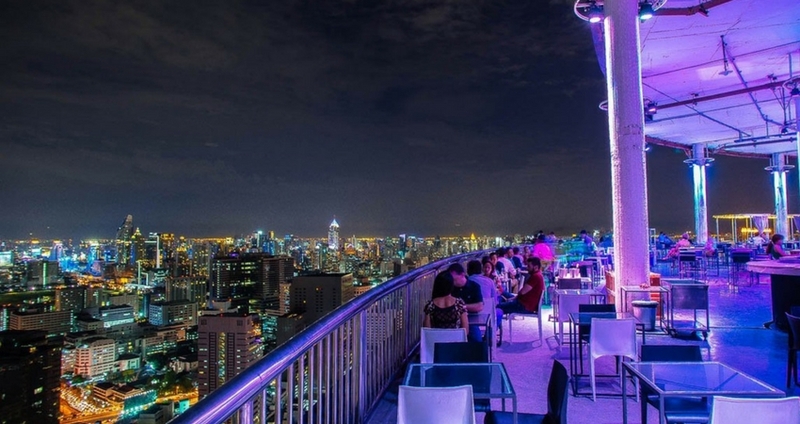 Otherwise, these rooftop bars on our list are ready to show you all the beauty and sophistication Bangkok nightlife has to offer.